1. The Race:Saturday was the enchanted 10K. 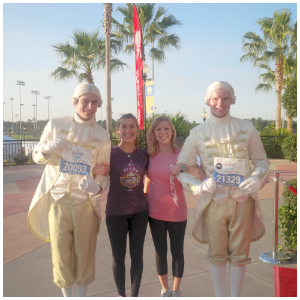 This is actually the first race as part of the Glass Slipper Challenge ( the 5K was not included in the challenge). Even thought the weather was suppose to be a little warmer, we still wore our leggings. I hate being cold at the start. 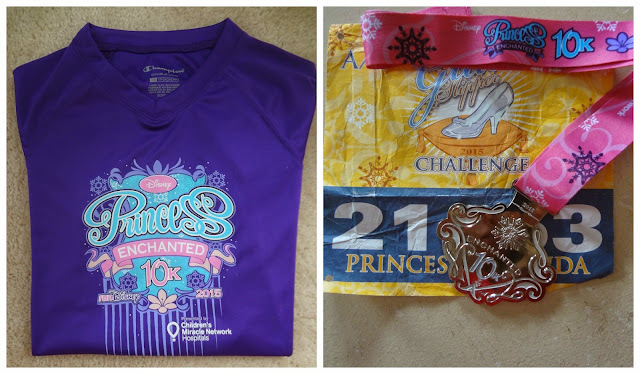 I even wore my Princess race jacket from last year but shed it after the first mile when it started to warm up. I carried it for a while and then my lovely sister said she would carry it for me the rest of the way. Since my sister and I were both in corral "A", we decided we would stick together. ( yup, this is the first time I've ever been in corral "A" with my sister in anything other than a 5K...lol. My mom was in the same corral too, but was running a little faster than we were. Since my sister and I were both having knee issues, we wanted to be a little more conservative with this race. 2. The Course:We both really like this course. The start is in the Epcot parking lot (same as the 5k). It goes up on the highway and loops around to the back road before you enter Epcot (like it does for the 5K). But unlike the 5K, the 10K crosses the International Gateway in Epcot and then goes around the Boardwalk area, passes the Swan and Dolphin, and Yacht and Beach Club resorts before entering Epcot again and then finishing in the same spot as the 5K. At one point I actually felt "normal" and pain free as I was running. It has been SO long since I have ben able to run without any pinching in my leg. I actually felt so "free". But that feeling didn't last long. 3.Pictures:Although we like the course, We feel that this race is lacking in characters. We always skip the first character stop because it's just way too dark at that time and the pictures don't turn out clear, making it a waste of time for us to even stop. 4. Time:We weren't running this race for time, but in the end we ended up coming in several minutes earlier than we did last year which was a fun surprise! 5: Bling:The medal is the same basic design as last year except it is silver instead of gold. Also there is a snowflake on it instead of the Cinderella carriage that was on it last year. Of course the ribbon is different as well. 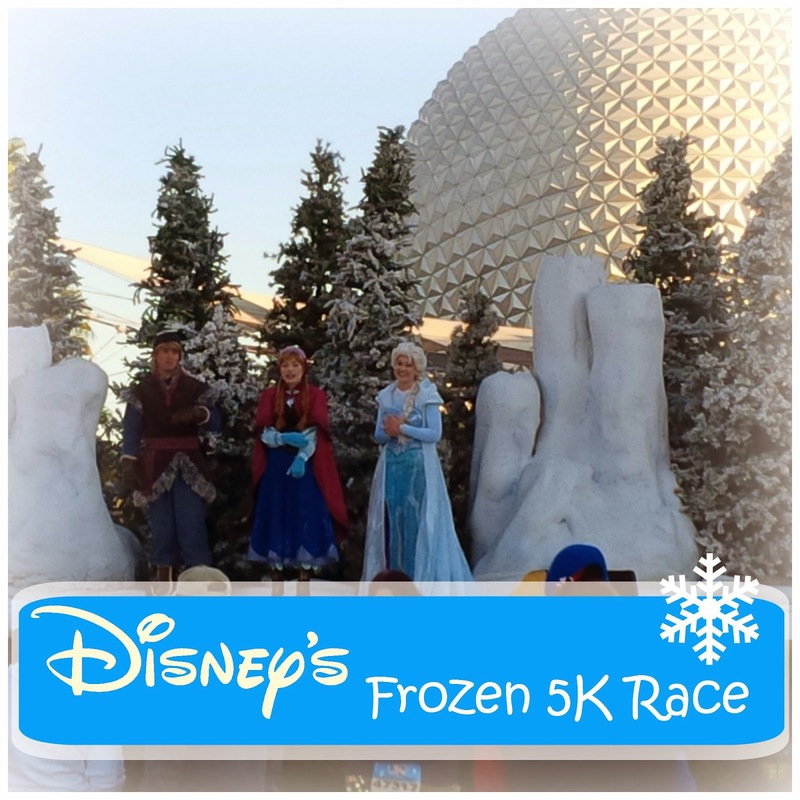 Check out our Disney Frozen 5K from the day before HERE. The first race of the Princess Race weekend is the 5K. 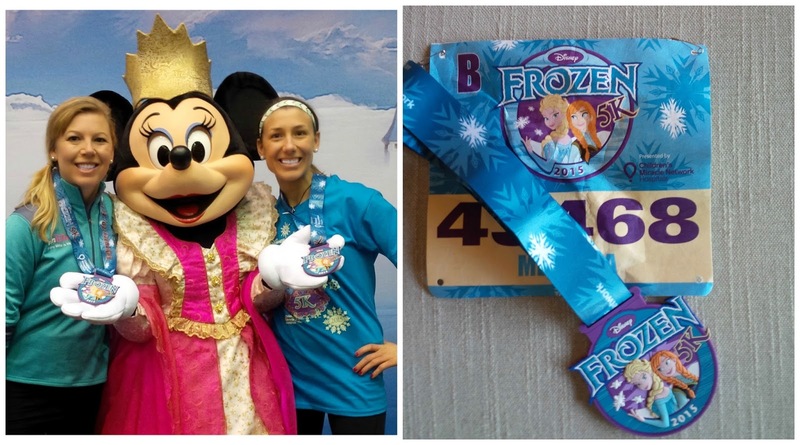 It use to be called the Royal Family 5K but it looks like it has since changed its name to just the Princess 5K and this year it was the Frozen 5K, literally. 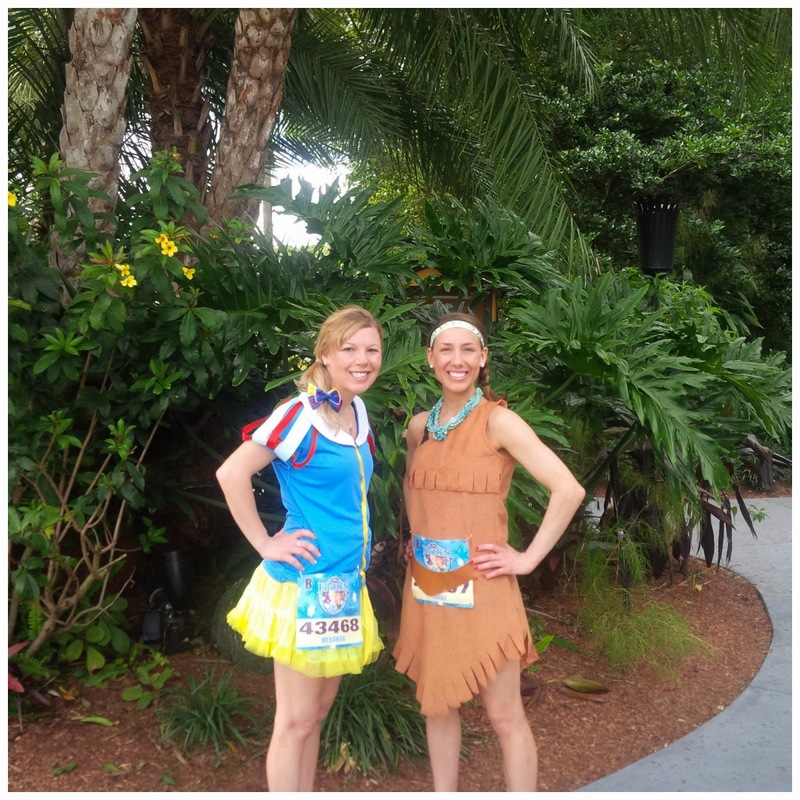 I never ended up showing our race day outfits for the 5K before we left for Florida, so here they are. Snow White and Pocahontas. Our mom ran with us and she was Belle. Now of course this is what we "Planned" on wearing. But the weather on Friday morning was freezing ( and I'm not exaggerating), so these outfits called for a few more layers. I had a base layer long sleeve PLUS my throwaway jacket with a hood underneath my Snow White shirt and I had fleece leggings AND Tights on under my skirt. Lacey and mom also had a base layer, long sleeves and leggings on under their outfits as well. My mom loved her new Rock City Skirt! Notice the bow in my hair? That was made by my lovely friend Kim. She also gave my mom a "Belle inspired" bow to wear. You may remember me saying from earlier this week that my flight was delayed by 7.5 hours so I never made it to the expo on Thursday evening to pick up my bib. Well, I had no idea that we were able to pick them up on race day, so this was such a relief and a great option! The only problem was that when we got to the runner relations tent to pick them up that morning, there was such a long line Even though my sister already had her bib ( she was able to make it to the expo because her plane was NOT delayed), she waited in line with me. We ended up missing our corral and had to jump in a further one. This really wasn't a big deal since it was just a fun run anyway but since we were further back, we ended up waiting longer in line for character pictures. We were so excited to see that the classic Disney characters, Minnie, Mickey, Pluto, and Goofy were on the course because we rarely see them during a 5K. However, Since it IS the Princess 5K, we thought that it was odd that there were no princesses on the course (or characters from Princess movies). I thought that perhaps since it was SO cold that morning that maybe a switch was made at the last minute. 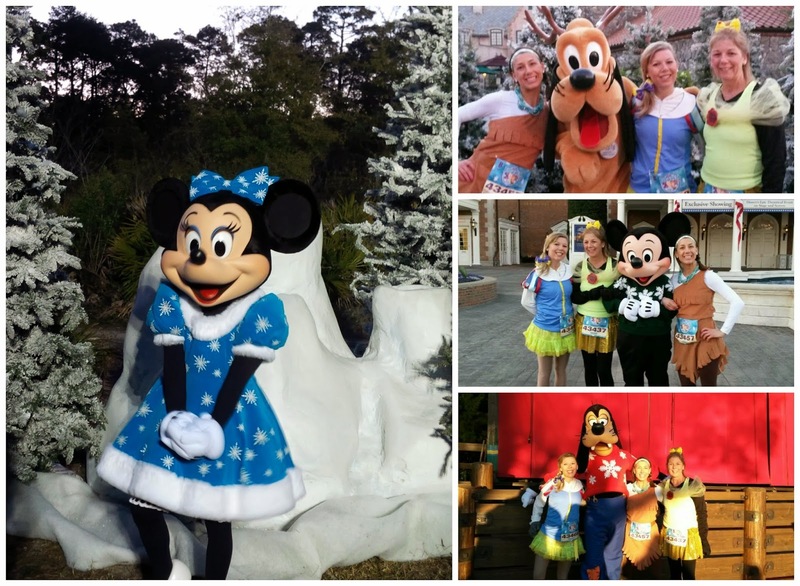 Maybe Disney didn't want "Face" characters on the course for that long and thought these "costumed" characters would be able to stay warmer for the length of the race. 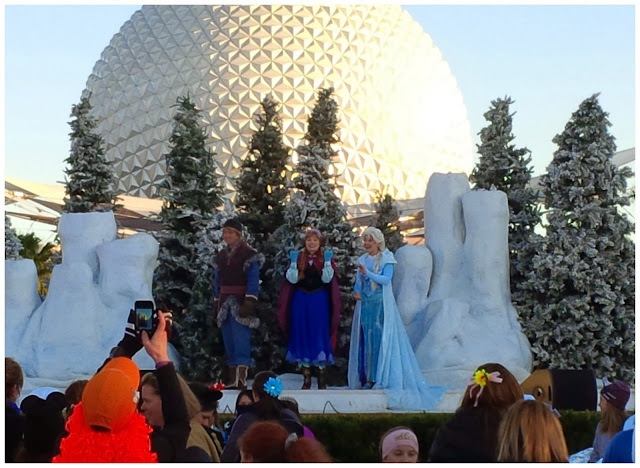 We were glad to see that in the center of Epcot there was of course a stage with Frozen characters up on it, for Display purposes only. You couldn't get pictures with them. Could you imagine how long those lines would be? A few characters we found after the finish line. I have to say that I believe this was actually one of the coldest races I've ran. I kept my gloves on during the race and only took them off for pictures. During those few seconds I could feel my fingers becoming numb. 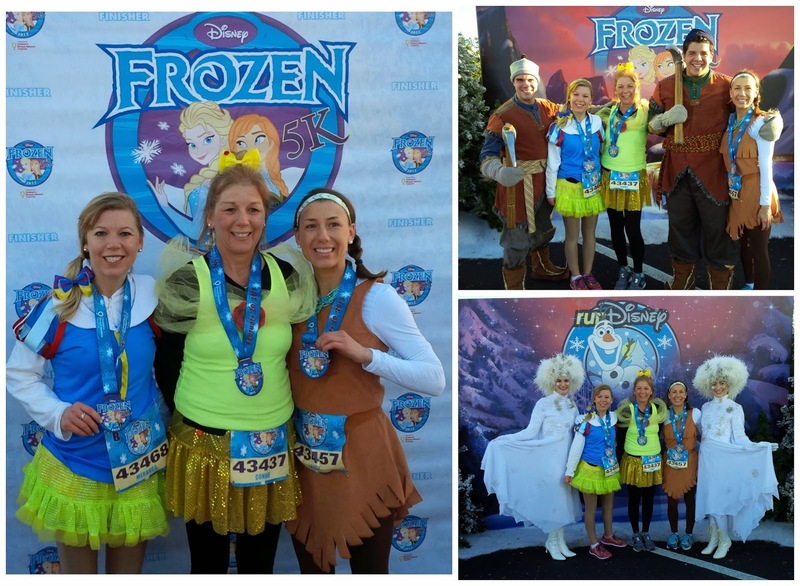 I wonder if this is really what Disney had in mind when they named it the Frozen 5K? Minnie really liked our "medals". What was the coldest race you've ever run? For those of you who ran the 5K during marathon weekend, was this one colder? 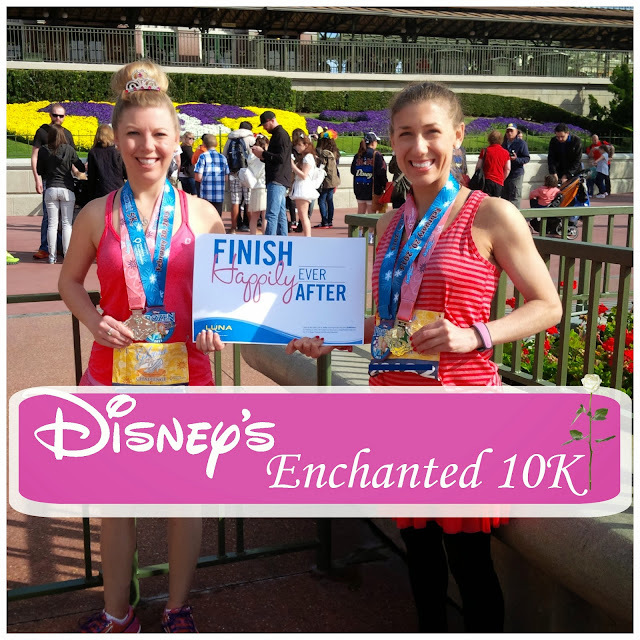 We ran Disney's Enchanted 10K the next day. You can read about that HERE. 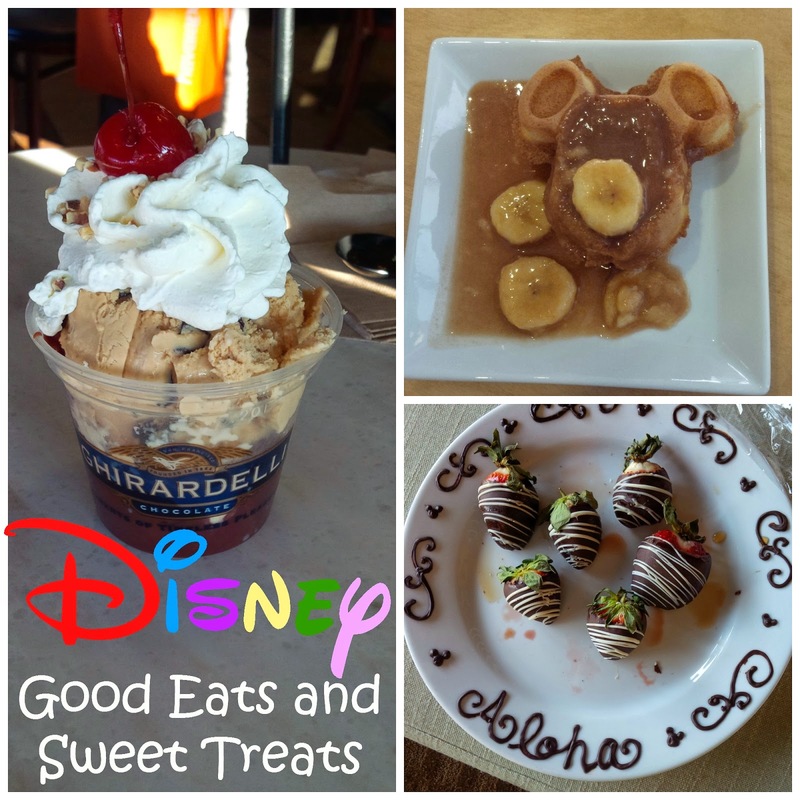 Since it is Wednesday, we thought we would do a "What WE ate Wednesday, Disney Edition. One of the most fun things about Disney is eating at their unique restaurants. Although most Disney visitors make their dinning reservations 180 days in advance, we usually just "Wing it". So far that method has worked out okay for us because we have been able to get in to every place we wanted to. 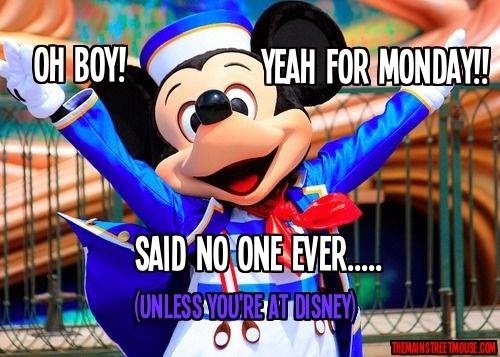 There have been a few times we've made reservations once we arrive at Disney and that has worked out for us too. 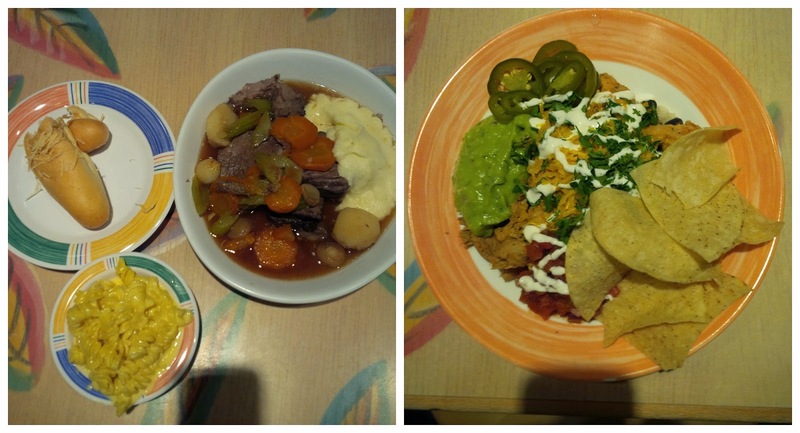 Here are just a few dishes that we remembered to take pictures of. Please don't be offended if you see meals that have already had bites taken out of them. A meal at the Rainforest Café is always a must. 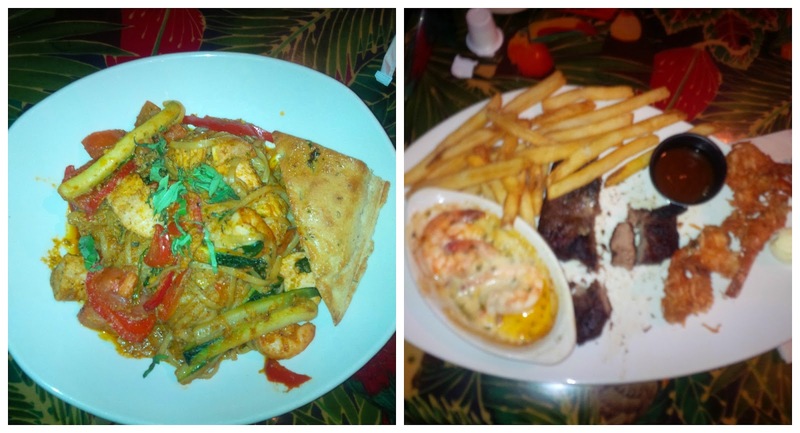 Lacey got the linguini with sauté veggies, chicken, and shrimp and I got my favorite Jungle steak and shrimp that come with shrimp scampi and coconut shrimp. I usually get mashed potatoes but decided to mix things up a little and got French Fries! Exciting I know! Dessert at Ghiradelli is always a tradition during race weekend. 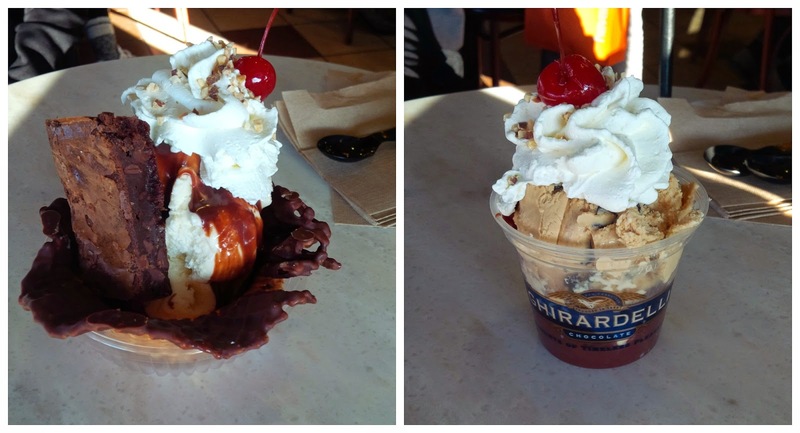 On the left is the brownie sundae in a waffle bowl. On the right is the cappuccino sundae. One evening we decided to play mini golf at Fantasia Gardens, so since we were already over that way we decided to eat at the Swan and Dolphin resort. I ordered the Pot Roast with 2 sides ( mashed potatoes and macaroni and cheese). Lacey ordered the chicken burrito bowl. My mom had the lasagna with 2 side dishes which we neglected to take a picture of but she said it was fabulous! One of my favorite dishes of the weekend was the Tomato and mozzarella salad from Tony's Town Square in the Magic Kingdom. You actually got 4 slices of tomato and mozzarella but this was one of those times I was eager to dig in before the picture got taken. Lacey and I both ordered the Shrimp Scampi with sun dried tomatoes and asparagus. 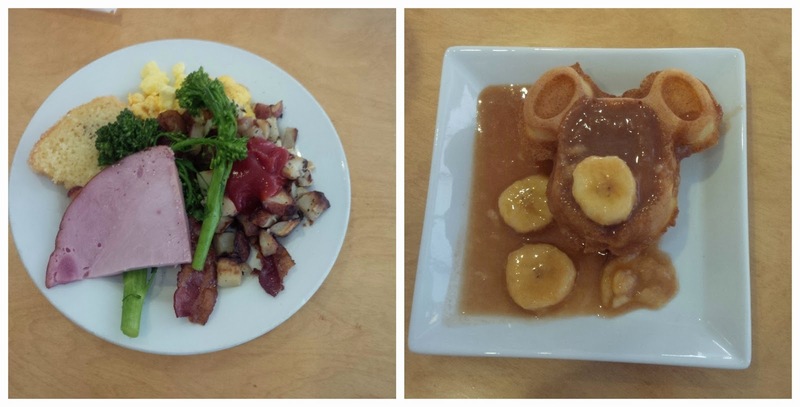 One day we went to the Cape May Buffet at the Beach Club for brunch. Since this was a buffet, there was much on the menu! Perhaps we will review this restaurant at a later date. 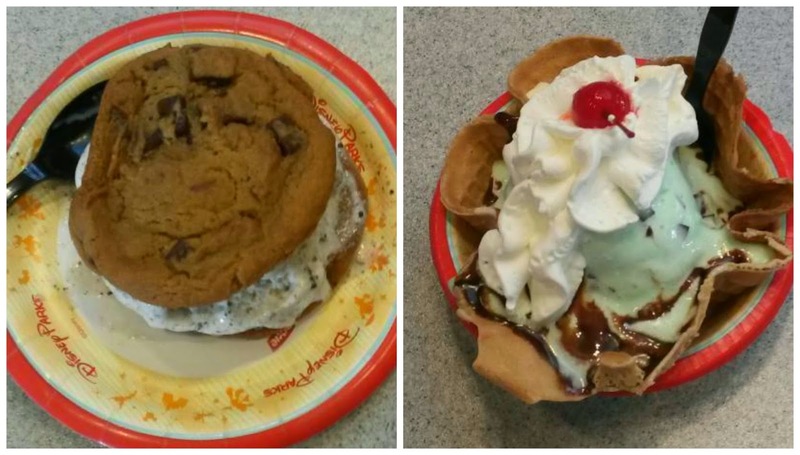 Snacks at the Magic Kingdom consisted of an ice cream sandwich cookie for Lacey and a Plaza Sundae for me. Of course we both shared a little bit. Lacey ordered the cookie with cookies and cream ice cream in the middle and the soft chewy cookies were just fabulous. My sundae came with 2 scoops of ice cream so I ordered mint chocolate chip and birthday cake. They were both good but the birthday cake was way too sweet and I couldn't eat it all. Another tradition during race weekend is that we always try to eat at Kona Café after one of the races. 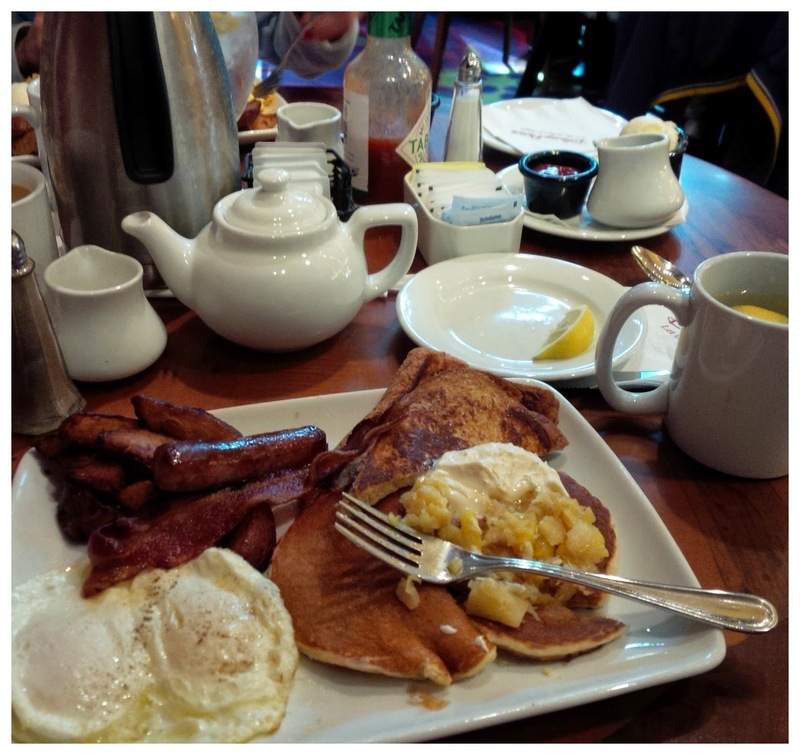 We always order the Big Kahuna which is French Toast, Pancakes topped with Pineapples and macadamia nut butter, 2 eggs, bacon, ham, sausage, and home fried potatoes. Strawberries and sushi also from the Polynesian. We also had some meals at the Contemporary and Grand Floridian that didn't make it until the camera came out. It was one of those situations where it was late and we were hungry! Unfortunately no cupcakes or Dole Whips were consumed on this trip. Maybe next time! What is your favorite "treat" to get while on vacation? Do you have a favorite food you eat after a race? 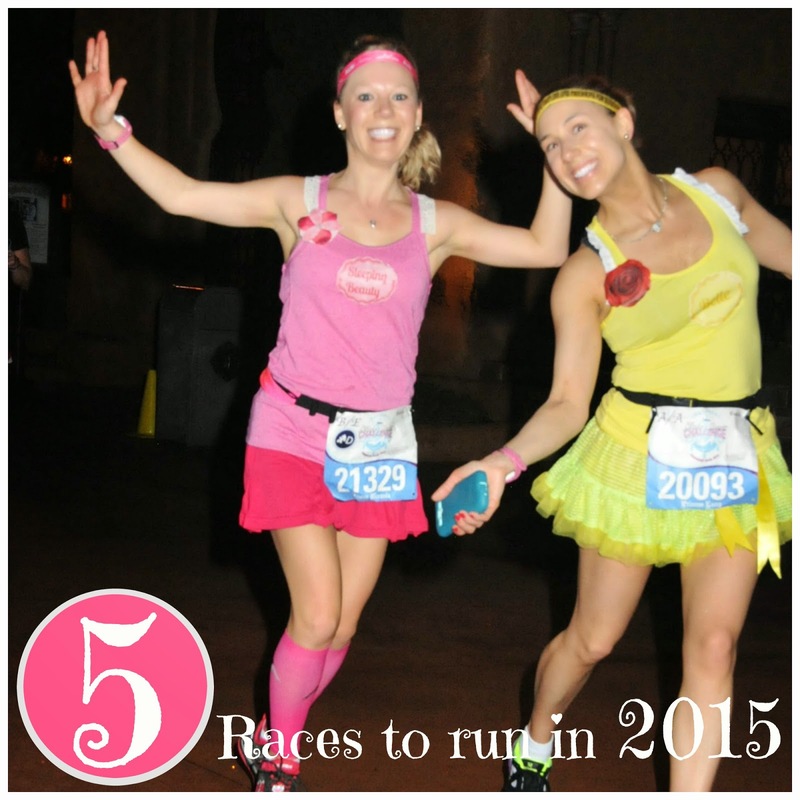 Today's theme for the Friday 5 is Five Races to run in 2015. 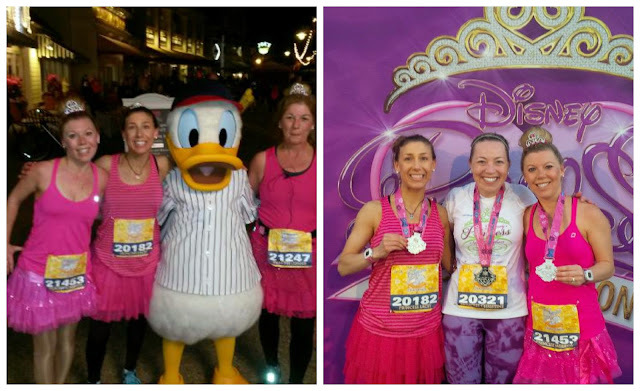 We will be completing our 3rd, 4th and 5th races of the year this weekend while we are at Disney. Today is the Royal Family 5K, Tomorrow is the Enchanted 10K and Sunday is the Princess Half Marathon. So what else do we have on the schedule this year? Well, as you know, we both have been struggling this year with injuries so we aren't loading up our race calendars. We think it's time we really taking resting more seriously. But in the meantime, here is what we have "planned"
1. April Fools Race: (April)We've done this race for the past two years. The weekend consists of a 7K, 11K, and half marathon. Although last year's race wasn't as fabulous as the year before, it is still worth participating in, especially since it's a weekend spent at the beach and we got a free entry. It use to be put on by the Revel resort but since that closed I am anxious to see how the race will be handled. 2. Tinkerbell Half Marathon: (May) This will be the first Disneyland race for both of us. As you can suspect, we are very excitedly looking forward to it. 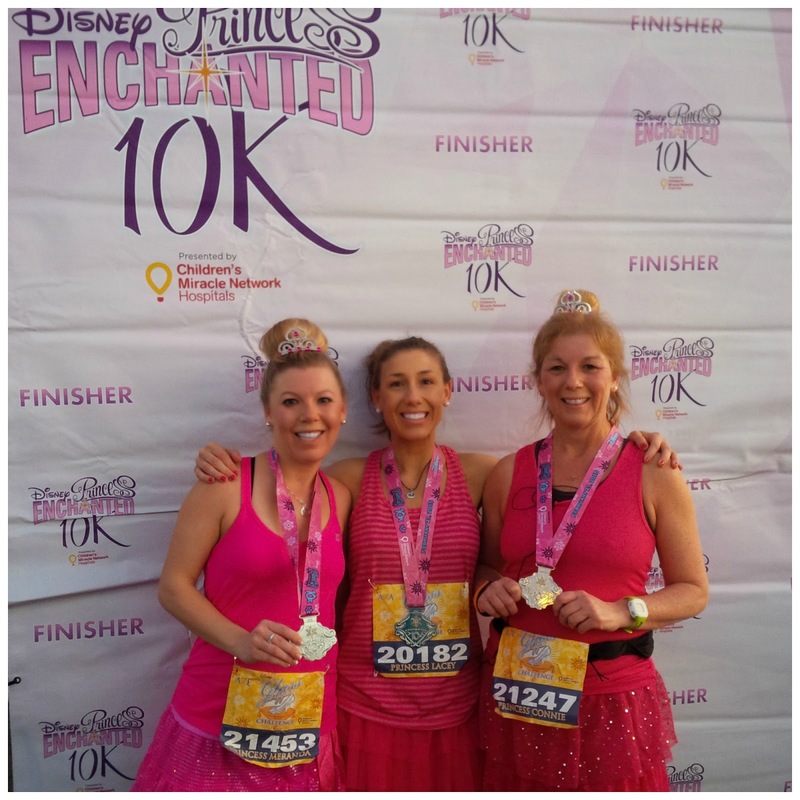 We will be doing the Pixie Dust Challenge which consist of a 5K, a 10K, and Half Marathon. 3. Rock n Roll Virginia Beach: (September)This race is probably the reason we will never get to run the Disneyland half marathon. Both of these races are held on Labor Day weekend and by far is one of our favorite races! This will be the 4th year we will be participating in this event. 4. Rock n Roll Philadelphia: (TBD)This race probably wouldn't have been on our radar again this year but since we have an RnR tour pass to use, we are putting it on the list. Registration hasn't opened yet since a date has not been set. 5. To round out our RnR tour pass, we are considering RnR Savannah (November). We were considering Nashville but really don't want to add anymore races this spring since we are trying keep longer periods of recovery between races. But really a third RnR race is still up in the air. We're taking suggestions! What races are you looking forward to this year? 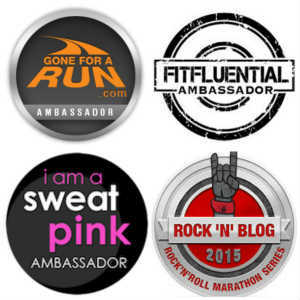 Which RnR race would you suggest? Happy Thursday folks! 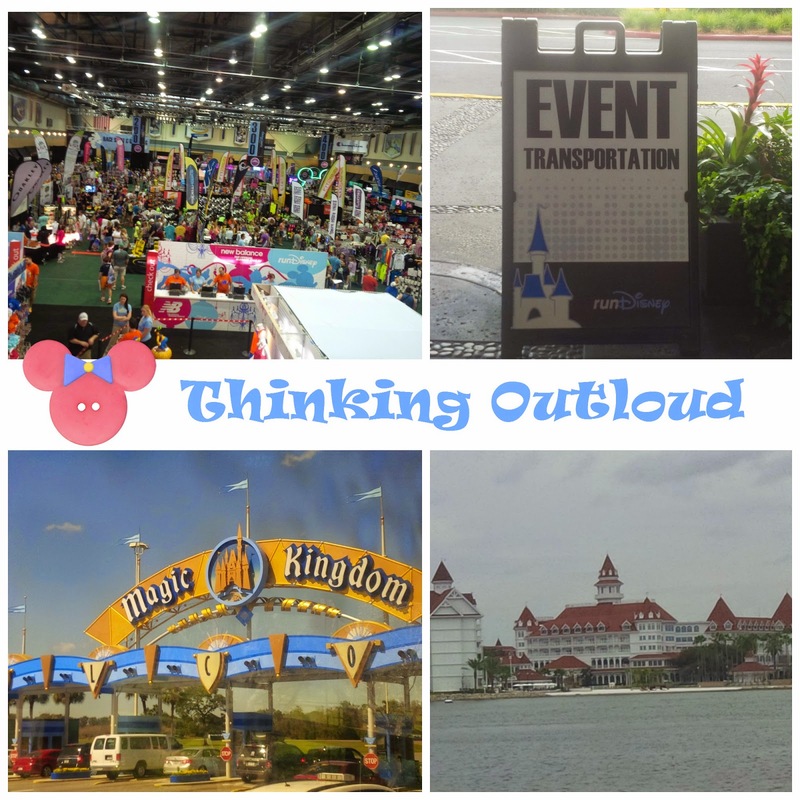 We thought today would be a god day to do another random thinking out loud post, so here goes! We are at Disney and the Health and Fitness Expo is on the agenda today! Since the day we booked this trip, we have switched our reservation to three different resorts. We were all set to try a new resort, but then an old favorite opened up at the last minute and we couldn't resist. We like being at monorail resorts because of the easy access to things. We plan to try a new resort on a future visit but a race weekend is not the time we want to try something new (at least resort wise). Speaking of trying something new, we will look to do at least three new things (hopefully) that we have not done before. The great thing about Disney is that no matter how many times you go, you can always have a different experience. One thing we are looking forward to is relaxing at Typhoon Lagoon after the race on Sunday. We hadn't been here in about 15 years. I hope the weather cooperates. When you go on vacation do you like to visit the same restaurants and resorts (because you know you already enjoy them) or do you make a point to always try something new? 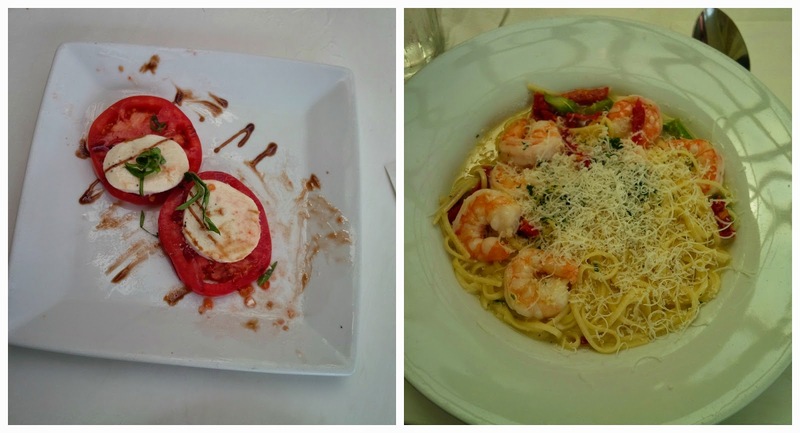 Since we knew we would be heading on vacation this week, we've tried to be really conscientious as to what we ate in the days prior ( meaning we tried to limited the junk food and sweets). We figured we would be splurging a little at Disney so we might as well eat "good" on the days leading up to our departure. After having chicken noodle soup for two days (I made a LOT), I decided I wanted something different so I made a healthy choice meal (while Scott continued to eat the soup). 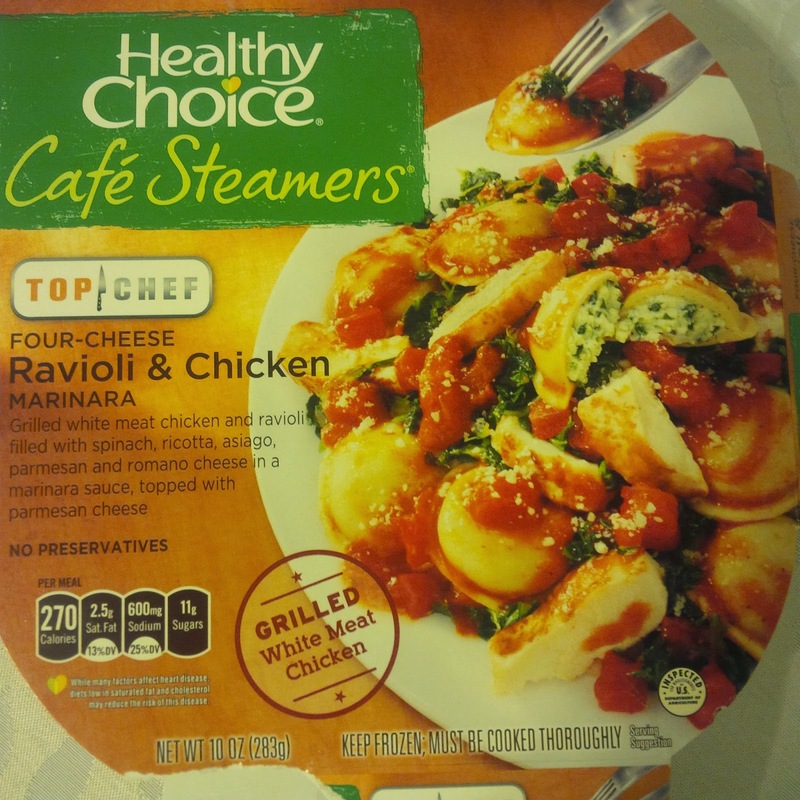 I've had the healthy choice pumpkin ravioli and really enjoy it so I thought I might like this one too. The verdict, it was alright but I probably wouldn't buy it again. 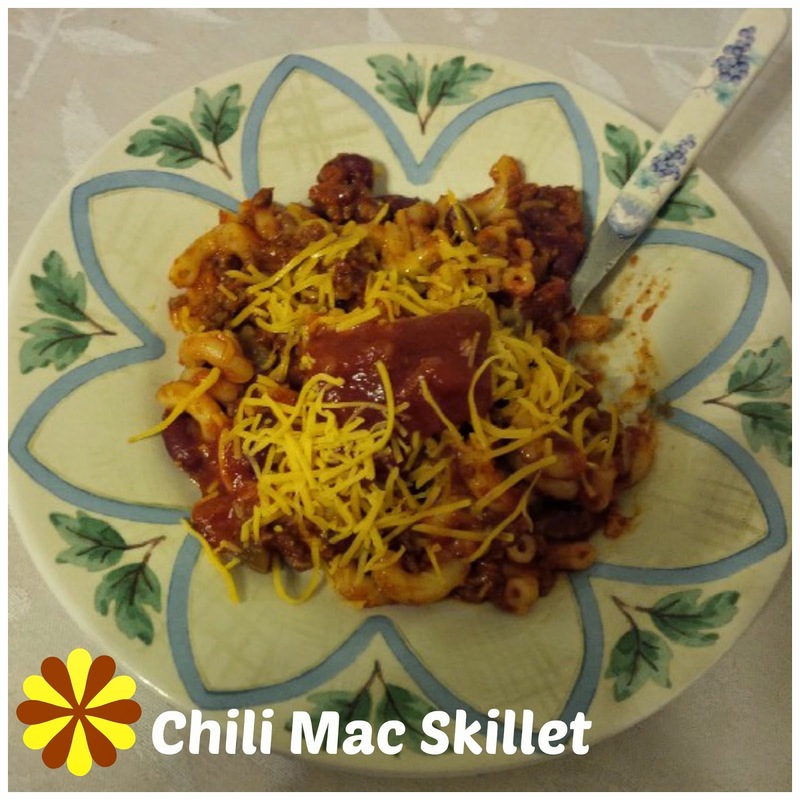 On Monday I made this Chili Mac Skillet topped with shredded cheese and salsa. 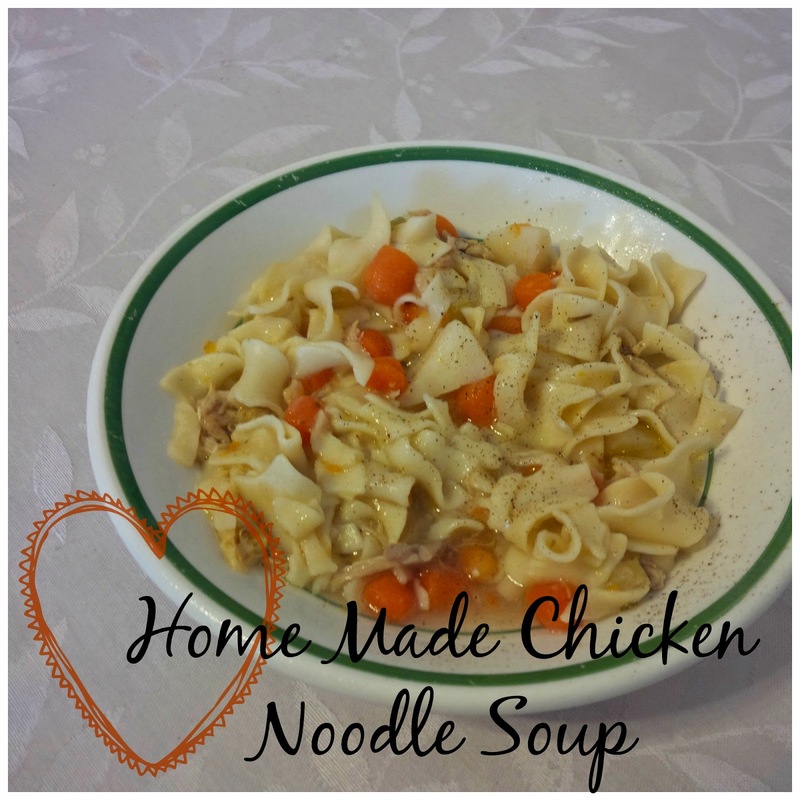 I got the recipe from Kathryn from the blog From Dancing to Running. I thought it was pretty good. I plan to make it again with a few variations. I'd like to try shredded chicken next time instead of ground beef. Thanks Kathryn! I received a free coupon from Smiley 360 to review this Seeds of Change line of products. They have several flavors of rice and quinoa but I picked the Spanish Rice. I can honestly say this was the BEST rice I've ever had. I've never been a huge fan of rice and quite frankly I can never make it quite right. Yup, even minute rice never turns out right ( neither microwave nor stove top). The nice thing about this is that you throw the whole pouch right in the microwave. It came out and every piece of rice was cooked correctly (When I make regular rice I usually have a few pieces that are still hard). 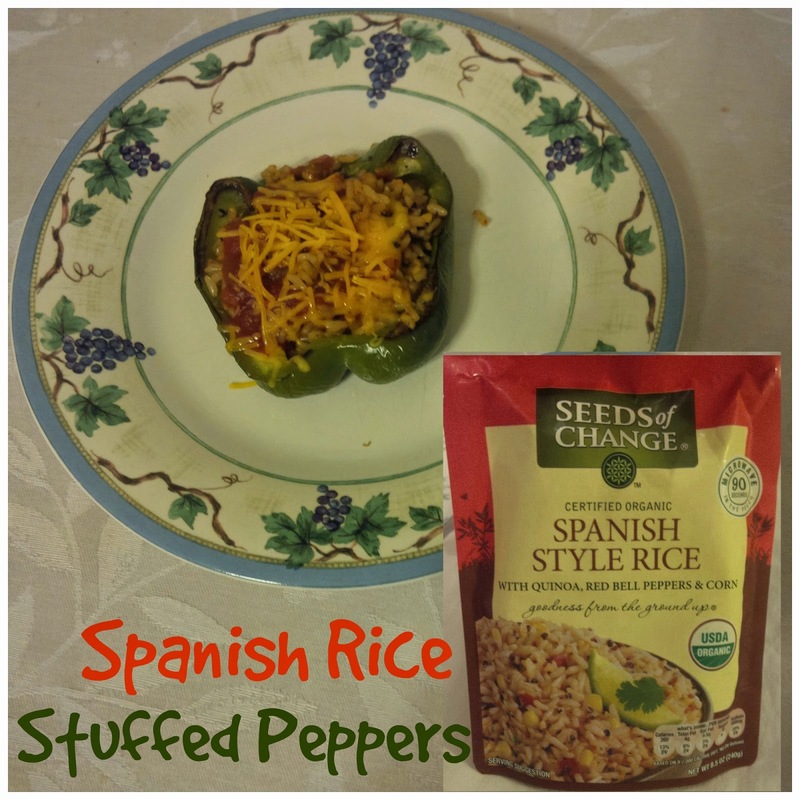 I may have even eaten a few bites right from the pouch before I stuffed the peppers. I had a difficult time finding the Seeds of Change products at my regular grocery stores but I finally found this one at Wal-Mart. Seeds of Change also has a line of sauces out that I really want to try but have not been able to find yet. If you would like to try any of the Seeds of Change products, you can get a coupon HERE. It was really hard to stay "good" this week because there were SO many sweets at the grocery store (because of valentines day). 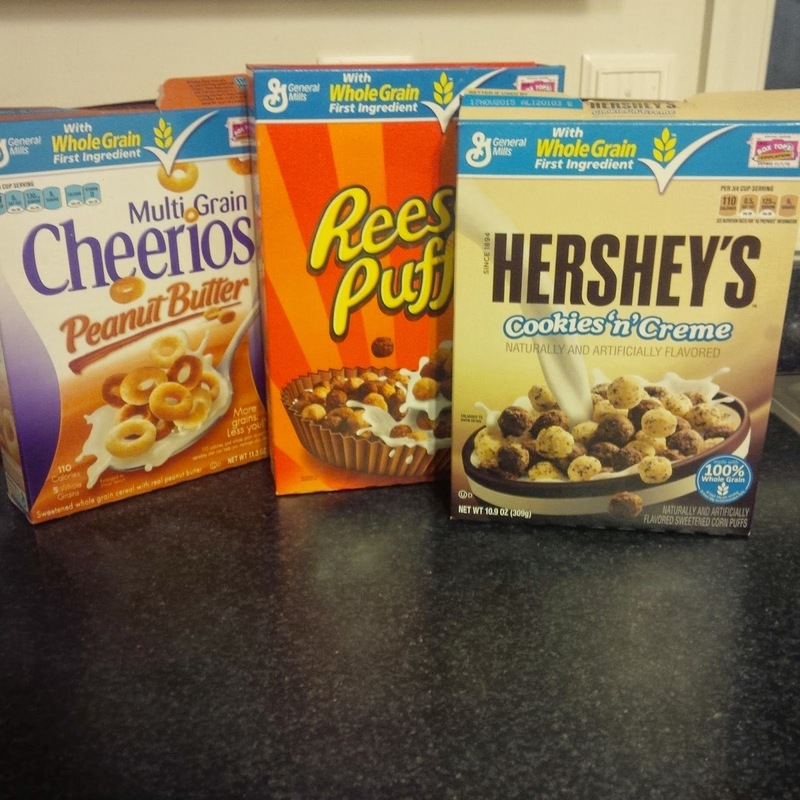 I almost gave in to the chocolate cherry cookies and the lemon drop cookies but instead I bought 3 boxes of cereal and called it even! I did have a small bowl of ice cream on Valentines day though. 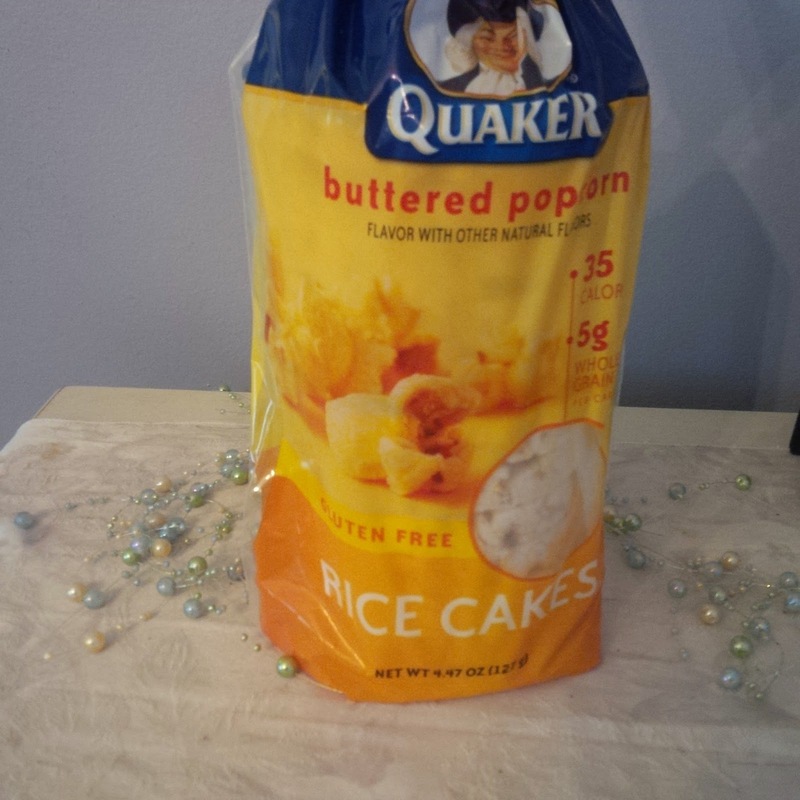 My go to snack lately has been the Quaker rice cakes. I've had rice cakes in the past and have forgotten how much I like them. I recently discovered the buttered popcorn flavored ones and have been hooked! Warning: You can't eat just one! I think I did okay this week. Alright now, we're on our way to Disney so bring on the cupcakes and the mickey bars! What great thing did you eat this week? 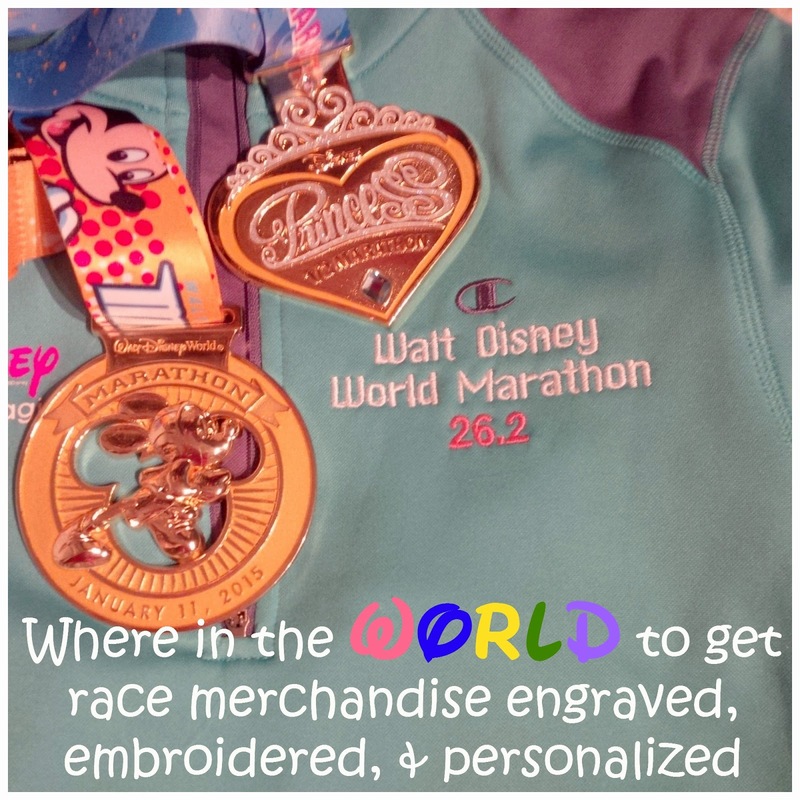 If you are looking to have some race items personalized in an effort to commemorate your race, there are actually several ways you can do that around Disney World. 1.The first and most obvious way to commemorate a race is to have your medal engraved. Lasting Commemoratives is the company that does it at Disney Races and they have a tent set up after the finish line. I have never done this but my friend Heather has so the information here is from her. It's $20 to get the engraving done and they prefer cash (but may accept credit cards too). You can actually pre-pay at the expo if you don't want to carry cash on you during the race. They will actually engrave any medals not just the Disney ones. So if you have medals from other races that you wish you would have got engraved, you can bring them here and they'll do it! When you get to the tent you will fill out a form with your name and bib number. It gets put in a line and there is someone there with a computer and engraver that does it right there. The wait is usually 5-15 minutes depending on how many people are in front of you in line. If you miss the engraving tent at the race or change your mind about the engraving on the days following the race don't worry. There are still a few places in the world you can get your medal engraved. 2. Arribas Brothers in Downtown Disney is a crystal gift/jewelry shop and has an artist on hand that will engrave your medal. Ironically enough I wanted to get a necklace engraved there and they wouldn't do that. 3. Disney's Wonderful World of Memories at Downtown Disney will also do engraving on medals. This one actually surprised me. I knew they embroidered Mickey ears but didn't know about the medals until the cast member had told me. So what other things can you personalize? What about getting your race jacket embroidered? I did that with a run Disney jacket I bought earlier this year. I wasn't crazy about the "official" marathon jacket so I just bought a run Disney jacket and had WDW Marathon embroidered on it. 4. At Disney you can get race jackets (and other items) embroidered at Adrian and Edith's Head to Toe shop at Hollywood Studios. You can even bring in non-Disney items and they will embroider them too. I hear it is a pretty reasonable price at around $10 an item. You can get things engraved here too! 5. Getting Christmas ornaments personalized with a race and date seems to be a popular thing to do. When we were at Disney for marathon weekend we saw the artists painting several Dopey Challenge ornaments. The cost for personalizing was about $12 plus the cost of the ornament. Ye Olde Christmas Shoppe at Magic Kingdom and Disney's Days of Christmas in Downtown Disney both personalize ornaments. Do this earlier in the day in case it takes a few hours to complete. Know that during a race weekend it may even take a day or two. 6. Glaskunst in Germany ( in Epcot) is an outdoor store that sells glass items that you can get engraved. How cool would it be to get a personalized wine glass with your name, race and a PR? Hmm, I think I might do this if I ever PR at Wine n Dine! They do beer steins too! 7. If you missed getting a T-shirt at the race expo, you can design your own. There is a Design a Tee in Downtown Disney that allows you to choose from hundreds of Disney images and then you can add your own words to it. I'm thinking this might be a great way to create your own unique "I Did It" shirt! 8. Also at Arribas Brothers you can get a picture frame engraved with the name of your race and date on it ( or anything that you want engraved on it of course). 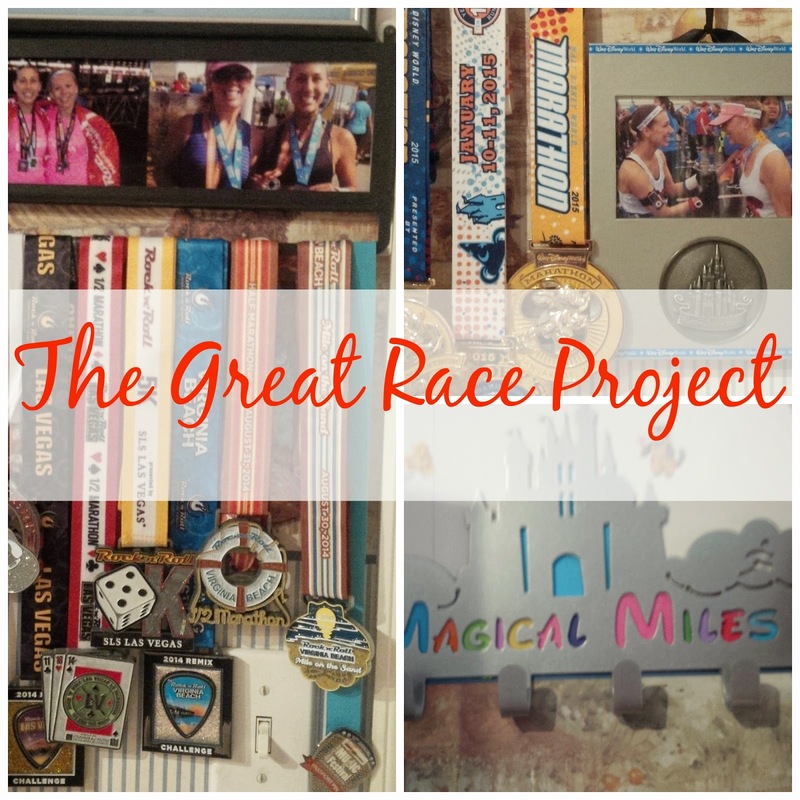 Of course there are other places around the "world" to get cool personalized items to commemorate your race but these are just the ones that we were able to think of right away. What is the most unique thing that you've done to commemorate a race? Hello Readers! Did you all have a happy Valentines day weekend? It was cold here and it flurried. Did I mention it was cold? I looked up the weather for Florida this week and gasped when I saw that it was going to be 54 degrees one day during our trip. This made me want to re-think some of the things I was going to pack. Since I didn't go anywhere this weekend, I got a start on my packing for Disney. If you know me, you know that I thrive on organization and I love lists. I intend to carry-on my luggage so it is very important that everything is organized. I decided to put a list together to help me visually see what all I needed and how I would pack it. Since I put the list together, I figured I'd share it in hopes it would help someone else who is packing for a race-cation. I have to divide my stuff up in separate categories and then each category gets put in its own gallon ziplock bag. 2. Snack Bags: In this bag I pack my Honey Stingers and any other race fuel I need ( remember GU's are considered a liquid and need to be in a separate ziplock bag. I also pack packs of oatmeal and some Clif bars so I can eat them for breakfast before the race. Food courts will not be open at 3am. 3. Race Day outfits: I'm sure you've heard this one before, but I've packed each outfit for each race in its own ziplock bag. 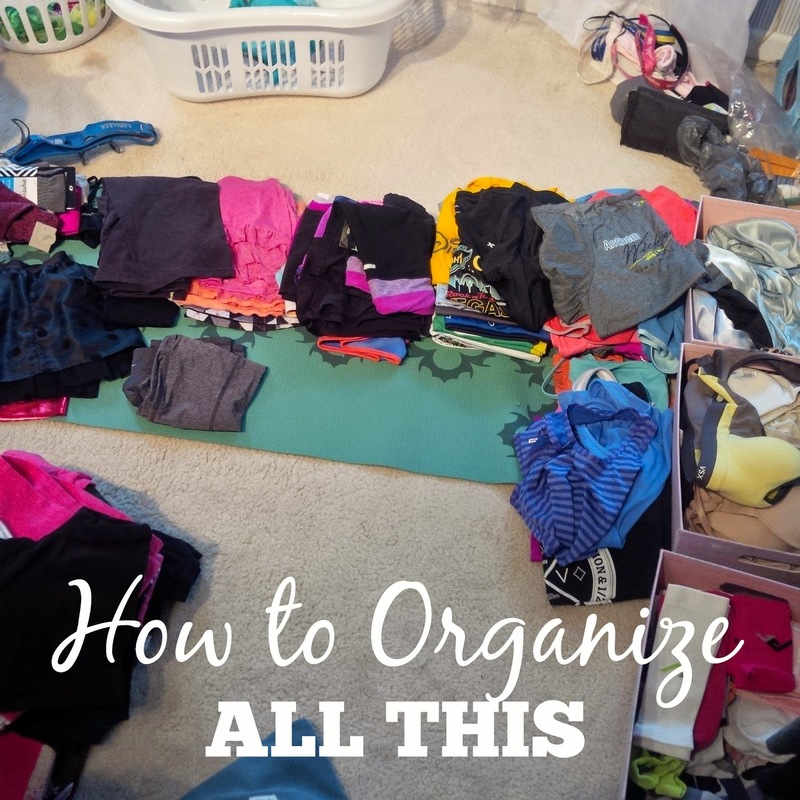 EVERYTHING that will go on for that race including the tank, shorts, skirt, sports bra, undies, socks, sweatyband, arm sleeves, compression sleeves, and hair ties. There is one bag for each race. 4. Running essentials. There are a few things I won't be able to get by without. Tiger balm and IBprofen are two of them. You may need KT tape, biofreeze, or a few other things. Also my hand held water bottle will be packed in this bag. Be sure to check out this list of items to bring with you to the start of the race. 5. Cosmetics and personal items. 6. Electronics. Runners have a LOT of stuff to plug in ( Garmin, Ipod, Phone, Camera, etc). I keep all my cords together in a ziplock bag so I can easily find them. Of course I then throw in the rest of the clothes I plan to wear during the week. Since this crazy weather has come into play, I'm still struggling on how many cold weather items I want to bring. 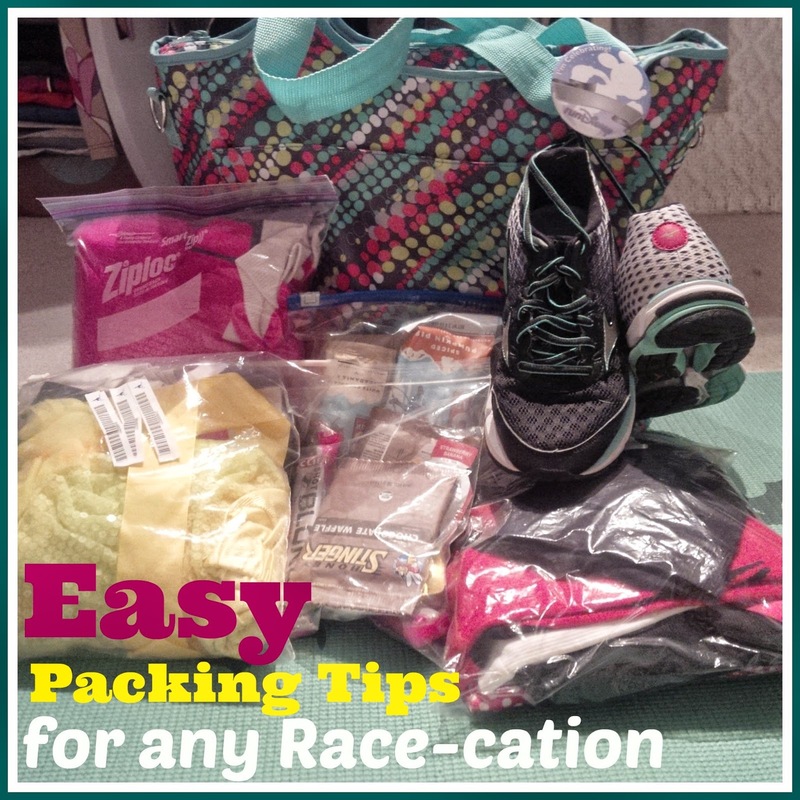 If you are unsure what you might need for a race-cation, check out this list of 7 things you might not think to bring but would be very helpful. I Also wrote a post last year called "What I'm packing and NOT packing" which might be helpful if you are carrying on and trying to save some space too. There are a few things that you just wont need to bother bringing. Happy Friday Folks! How many of you have something special planned tonight in anticipation of Valentines day? And how many of you have a scary movie planned because ya know it IS Friday the 13th? Since the Friday 5 topic is about Love, I don't plan on talking about anything scary here! 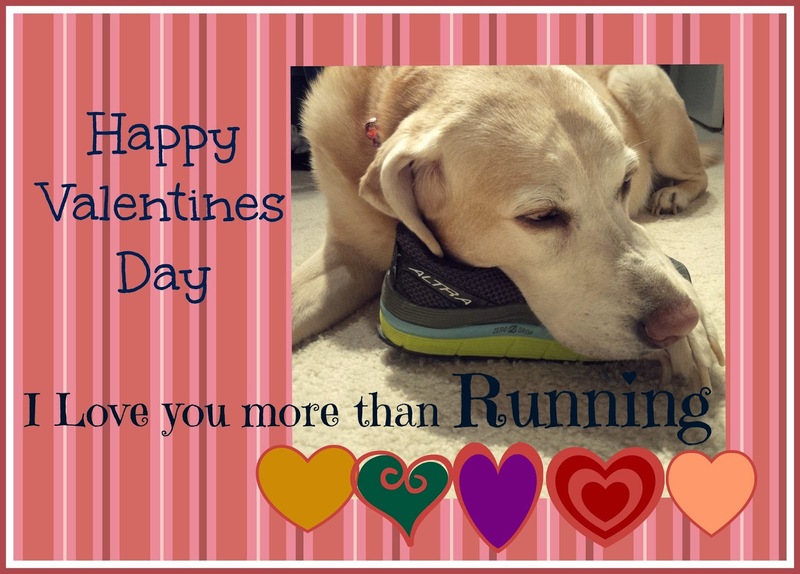 We are not huge into Valentines day, but I do like that it allows us to be creative. 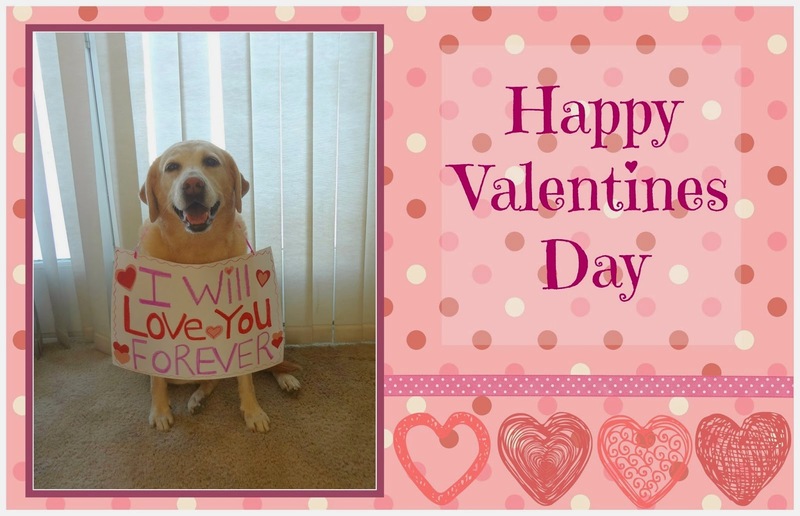 I love anytime to have a little photo shoot with my gal and what better way than to make Valentines for our friends. I know I showed some of these before, but I thought it was the perfect time to show them again. 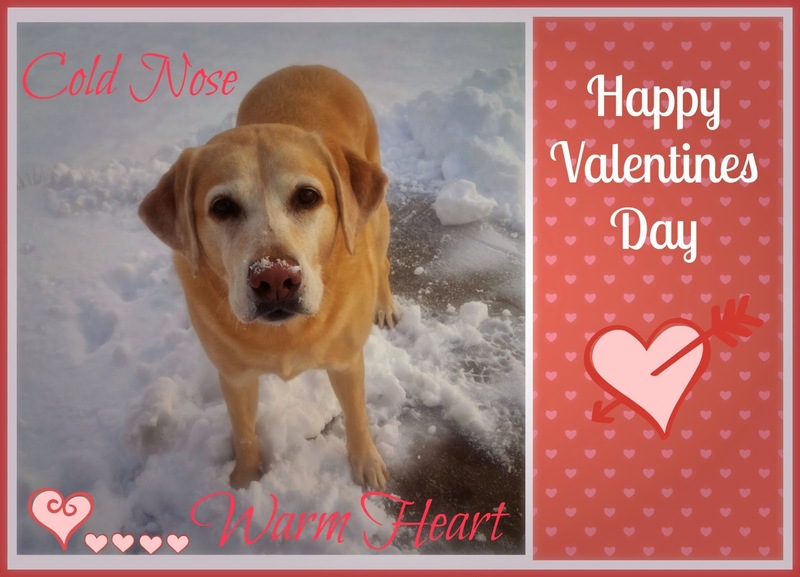 Our Valentine Card Collection throughout the years. 2. This one was from a few years back and was the most fun one to create. It always amazes me how patient this dog is and how well she behaves. I literally had no trouble having her stay in that box till I could take the picture. 3. This was last year's Valentine. This one is near and dear to my heart. 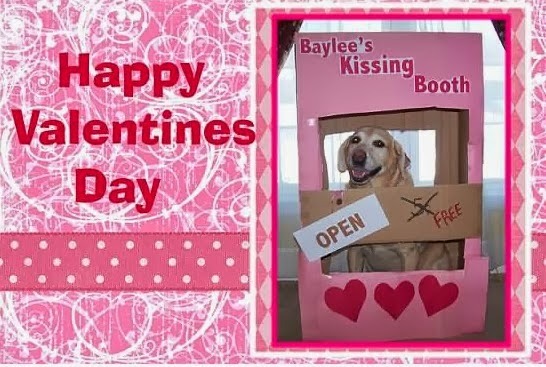 I think my parents love it too because this Valentine is still hanging up on their back door. 4. 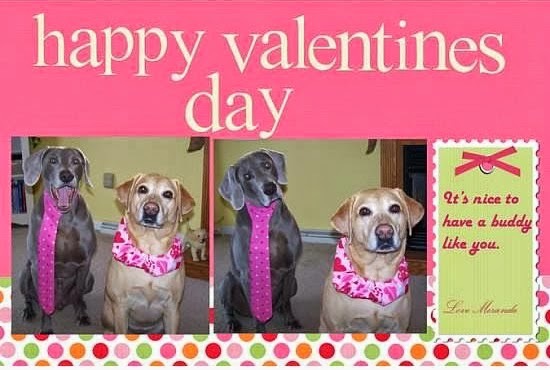 This is one of the very first Valentine cards that the dogs helped create! They were so co-operative even with the tie and ruffle. I almost feel sorry for these dogs for all the other sill outfits I've put them in over the years. You DID see the Christmas post, right? 5. This Valentine is for YOU. Use it as a virtual Valentine from us or maybe you need to send a valentine for someone and you don't have time to make one yourself. Feel free to cut and paste this one. We don't mind. We won't even try to take credit for it! Have a Good one friends! Are you doing something exciting this weekend? After spending some time in my dressing room working on my race wall, I decided I wanted to start a little spring cleaning. I can't believe how many running shirts I've accumulated over the years. I've found some that I never even wore yet. It made me think that maybe I should consider having a race blanket made. I previously had my running clothes in one of the sweater organizers but recently added a second one. I feel this lets me organize them easier ( all tank tops are together, all short sleeve are together, all long sleeve are together, etc). 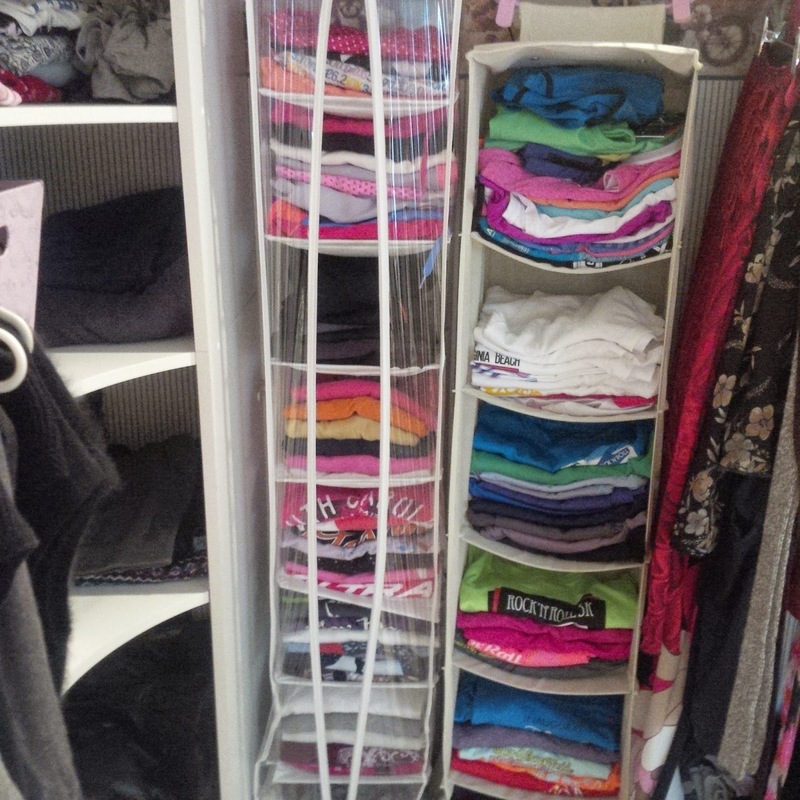 I am considering replacing the sweater organizer on the left with one that is the same type like on the right. The zippered front on it can make it tricky to get the clothes in and out. I love when my dressing room is organized. I put loose items, like running socks, in those pink bins to the right. This lets me easily grab them. l did something that is HUGE for me. I am not a pack rat by any means but I tend to hold on to certain items because I feel bad getting rid of them. I finally realized that it was okay to get rid of old college t-shirts and sweatshirts that I hadn't worn in years and I probably will not wear in the future. And it seems as though I have t-shirts from not only every race I've run, but every school I attended, every place I've worked, every vacation I've gone on, every sports team I've followed, and the list could go on and on. I have learned that I do NOT need to buy another t-shirt. I am really going to try to stick to this when I go on my next Disney trip. My husband has been after me to get an actual shoe rack. It sounds like it would be a good idea but I know that I wouldn't take the time to put the shoes properly back on the rack each time I'm done wearing them, (I'm just being honest here)! Some of this stuff has been re-organized since I took this picture. I actually have a few bags to take to the Good Will store. I definitely learned that sometimes less really is more! 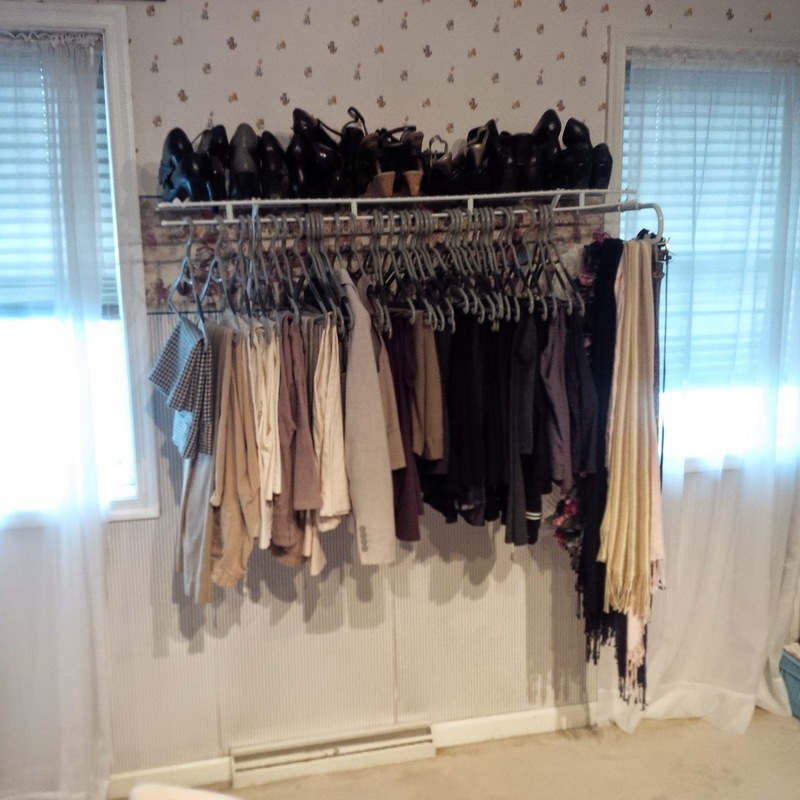 What would you learn by cleaning out YOUR closet? Is there something you admit to have too much of? The other day I posted on Instagram that I had a little project brewing. It looked a little like this. 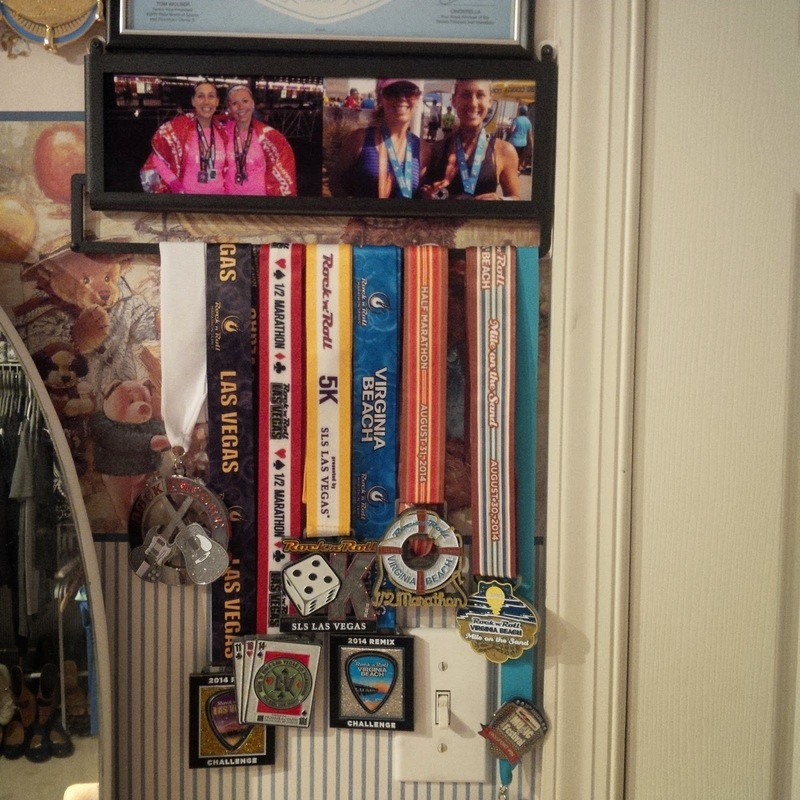 I knew I needed to update my race wall in order to have a place to hang my new Goofy Challenge medals. 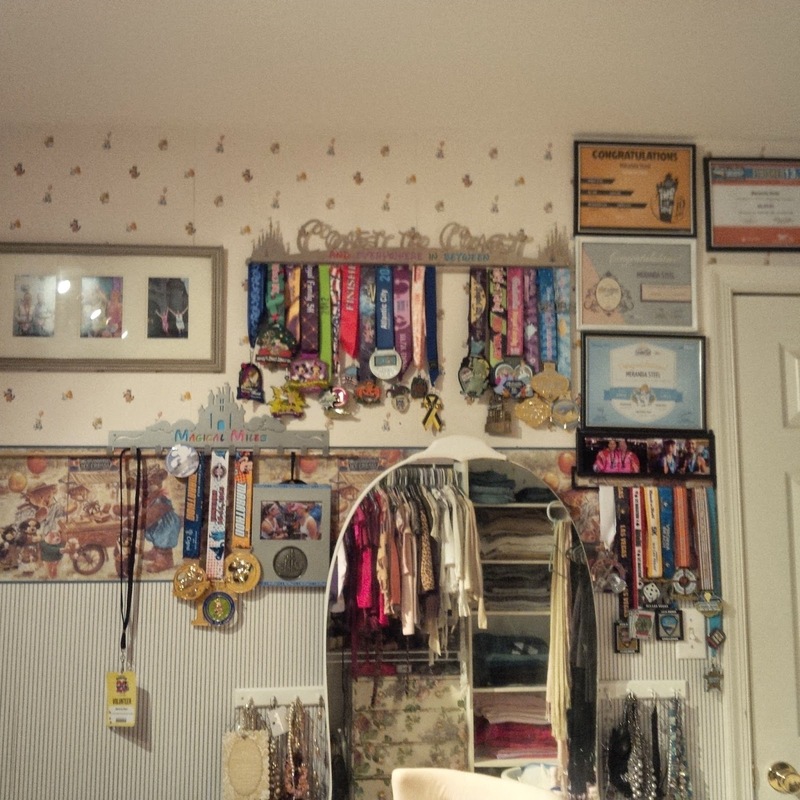 My medal displays were getting filled up and starting to look a little cramped and quite frankly a little messy. That meant it was finally time for me to hang my Coast to Coast display rack, but that also meant I had to move some other things around that I previously had up. 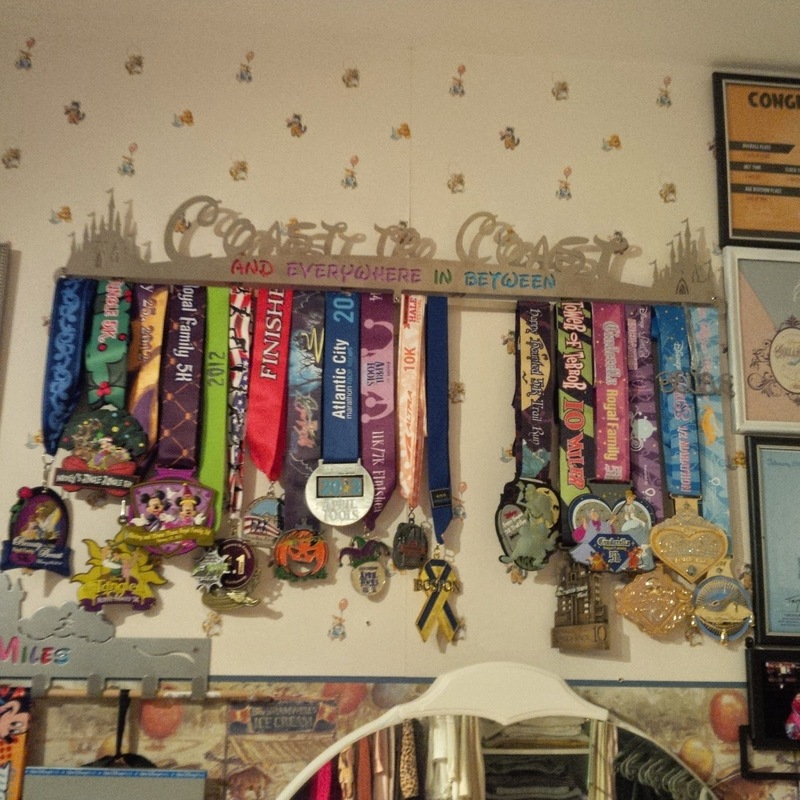 My Coast to Coast medal display: The empty space will be for my Tinkerbell medal and my Coast to Coast medal. So you may be wondering what all the colored paper had to do with my race project. Well, after I hung the display rack up ( I measured, leveled, drilled and hung it up all on my own by the way. Yup, I'll be asking for a little tool kit for Christmas this year..lol) anyway, after I hung it up, I noticed that you couldn't read the words very well (because they were cut out). Perhaps if I had a wall that was painted a brighter color ( instead of this awful wall paper that I won't get into right now) it might have shown up better. So, I cut out strips of paper (the acid free scrapbook paper) and placed it behind the words. I did the same thing with my "Magical Miles" display as well. This one was a little trickier since I used a different color behind each letter. It kind of looks like it was painted that way don't way think? 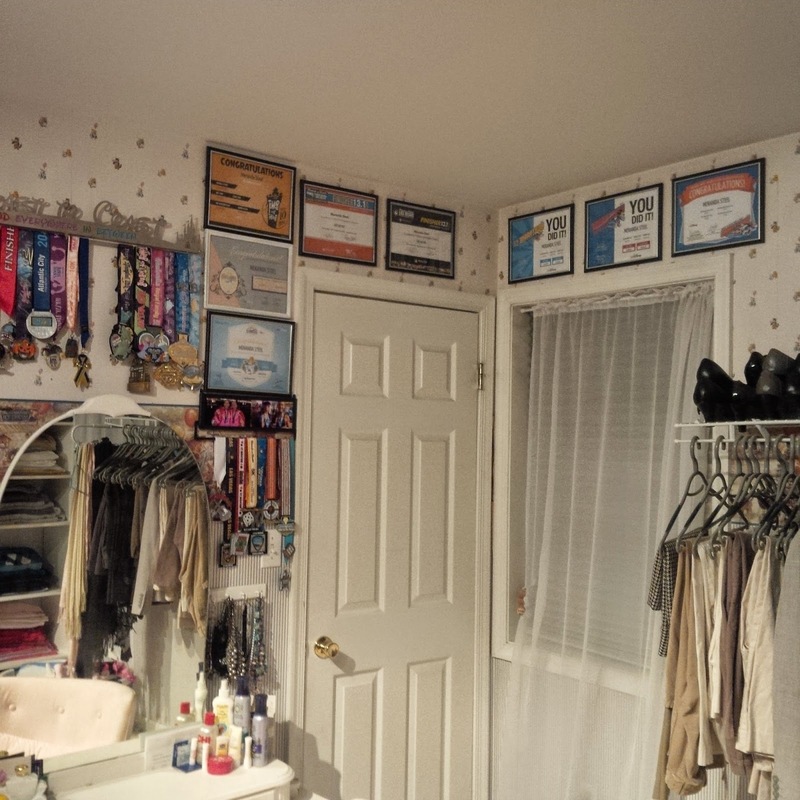 I have a fresh new display now for my Goofy medals and I have room to hang up my Glass Slipper Challenge medals when I earn them later this month. As I was cleaning my closet out I found this Disney picture frame that I never even pulled out of the box. It had to be from one of our trips at least 10 years ago. I forgot I even had it so it was a nice surprise. Since it was silver, I thought it would be perfect to hang near my medal display. I have it hanging off the display right now but I do plan on actually hanging it on the wall soon. 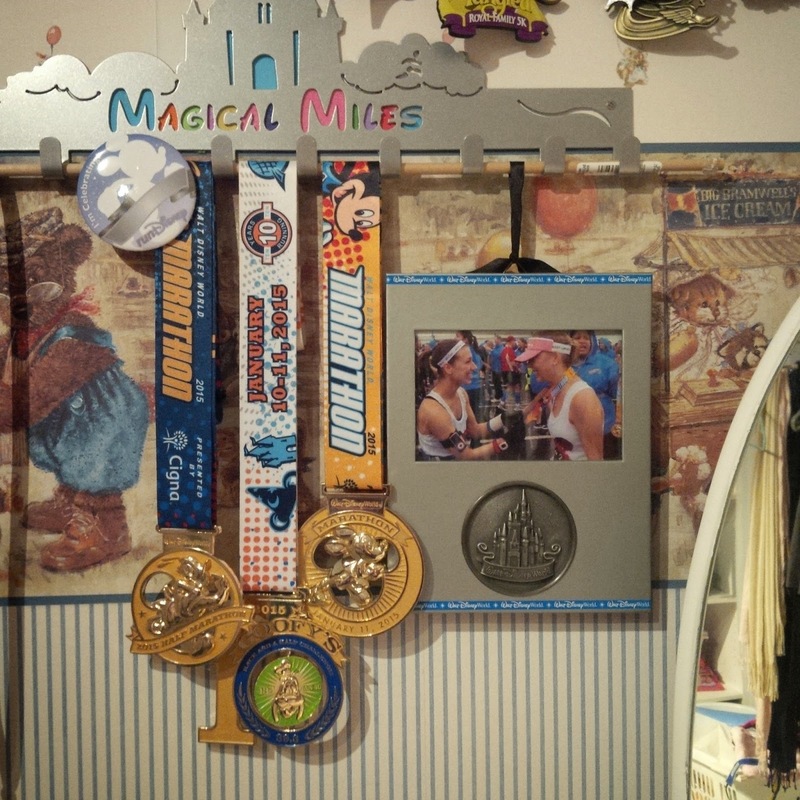 If you saw the picture of my race wall last year, you may remember that this medal display said "Magical Miles" and I had the Disney Princess medals on it. Since I was re-decorating here, I decided to now use this display for all the Rock n Roll medals I have. I inserted pictures from our last Rock n Roll races to cover up the "Magical Miles". 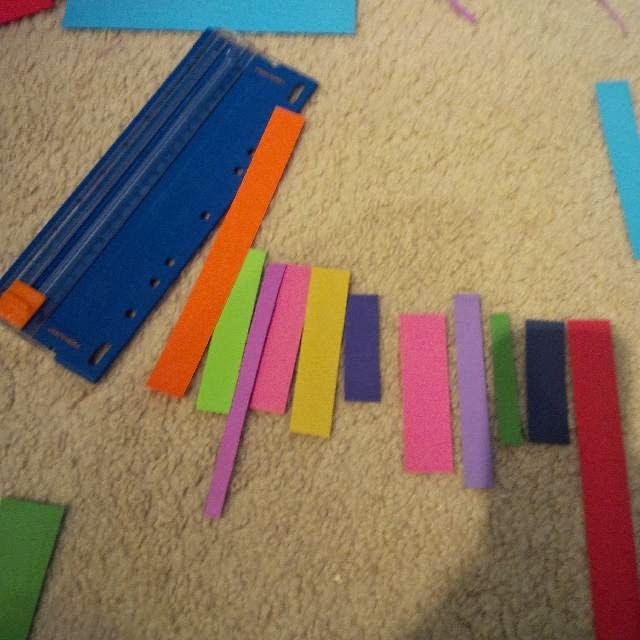 I alternated the lengths of the ribbons so each medal would hang evenly and not completely cover the other. And then of course I hung some of my race certificates. They don't look like they are hung evenly in this picture but believe me, they are. I measured. Things are a little different than the last time I showed my Race Wall. When I first started a race wall I thought it might be a little "too much" but I'm starting to like it. It only takes up one wall in my dressing room and it's not overbearing. Since this room is upstairs, I'm really the only one that sees it anyway. Looks like I have lots of room to add to it too. My sister and I were talking about this the other day and we were wondering if anyone else out there gives so much thought to how they display their medals? For example, I told her that I couldn't just put the Disney Medals on the Coast to Coast rack because it actually says "Coast to Coast and Everywhere in Between". So that means I need to put some of the "between" medals ( from non Disney races) on it too. If I didn't it would just be a Coast to Coast display, right? Did you understand my theory on that? Do you put much thought in to how you display your medals? Are you someone's Valentine this year? Do you like the traditional gifts of flowers and candy? I'm a candy gal for sure so that is one of my "go to" little treats on Valentines day. It's actually the gift I love to hate, or is it the gift I hate to love? Anyway, if you do not share in my loves of all things candy, you may prefer little treats like the ones below. With the exception of the running skirt from Rock City Skirts, all these items came from Gone For A Run. I'm loving the Candy heart T-shirt. Hmm, a shirt with Candy on it! If I was confident that I would be at the finish line of my next race, I would get that ( All joking a side, I WILL get to the finish line). Those shirts come in a few other colors and sayings too. The 13.1 heart in the corner is actually a shoe charm. Every runner needs a shoe charm! Since I am currently a Runner at rest, perhaps these goodies would be more suitable. I think those candy heart compression socks are just adorable (there I go again with the candy)! Do you exchange Valentines gifts with anyone? If so what types of gifts do you deem suitable for Valentines day?